At the initiative of Paul Ehrenfest, a special chair in Leiden was created for Albert Einstein, enabling him to come to our university for short periods of his choosing. 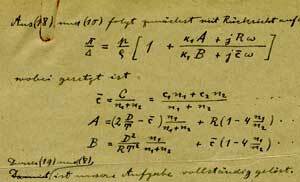 On October 27, 1920, Einstein began his new position with an inaugural address on ether and relativity theory. The yearly visits stopped when Einstein fled Europe in 1933. The position was formally terminated by the German occupation. Reminiscenses of Einstein's visits to Leiden are described elsewhere on this site. 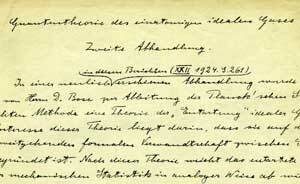 Here we present the three Einstein manuscripts preserved in our archives. Read the story of their discovery in Dutch and in English. You might also be interested in the papers of Alexander Friedmann, discovered together with the Einstein papers. The manuscript follows up on an earlier article, which is preserved in manuscript at the Hebrew University of Jerusalem. That earlier work, however, does not yet contain the prediction of the condensation phenomenon. Typed manuscript with handwritten formulas and corrections. 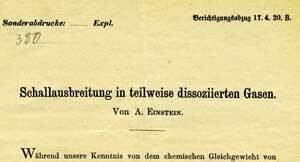 The publication (co-authored with Marcel Grossmann) appeared in 1914 in the Zeitschrift für Mathematik und Physik. 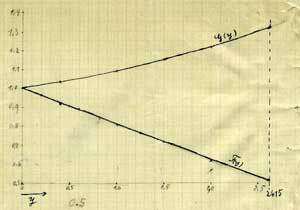 It reports on the heroic struggle to find generally covariant equations for the gravitational field, in which Einstein would finally succeed a year later. 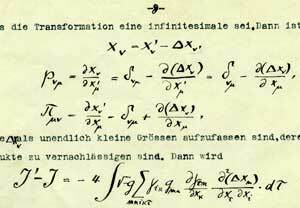 The handwriting of the formulas and corrections appears to be that of Grossman and Einstein, respectively. The typescript contains annotations by Ehrenfest ("does it make sense to separate x and t"), who had intensive discussions with Einstein on this problem. 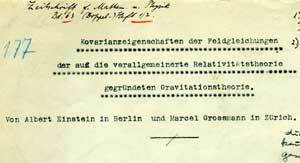 Einstein may have left the document in Leiden upon his visit of March 1914.